Contemporary design encompassing craftsmanship and artistry of a bygone era. Vicky Rowe's NEW Nouveau bridal collection for 2016/17 has a distinctive blend of 1970's silhouettes with exquisite Art Nouveau inspired scintillating beadwork. The full collection is currently exclusively on preview in Luellas Boudoir London. Three of my Vicky Rowe's new 'Nouveau' collection gowns were featured in Style me Pretty in September. A sample sale is taking place on Sunday 19th April at Vicky's studio in Mid-Wales. 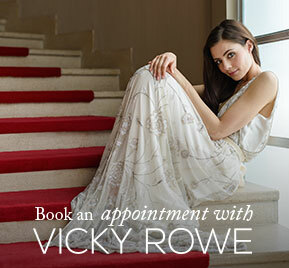 An excellent opportunity to meet Vicky and walk away with a pristine wedding sample gown for less than 50% of the RRP. Gowns in the Sample sale include, Evelyn, Rebecca, Greta, Rose and Primrose. I'm holding private consultations on the 29th & 30th of November 2014 in Windsor where you can see my gowns up close and try on the collection. There are a few slots left so if you'd like to come, please email info@vickyrowe.co.uk booking is absolutely essential. Rebecca is featured in You and Your Wedding Magazine!